Raw hide left untreated quickly decays or turns stiff. Tanning is the process of treating the hide and transforming it into that flexible, rich and durable material known as leather. There are two major approaches to tanning. One is called Chrome Tanning and the other is called Vegetable Tanning. 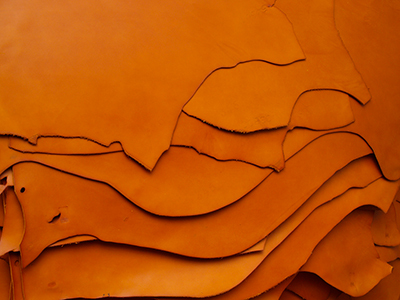 At Itagaki, we have used Vegetable Tanned Leather exclusively for our products since we first established. Vegetable Tanning is an ancient method that uses "tannin", an astringent extracted from the bark of plants such as the mimosa and the chestnut. The tannin treatment process is slow and typically lasts for about two months. Leather tanned by this method demonstrates less shrinkage, is typically more robust and deepens in color with age. "Pit Tanning", Itagaki's method of choice, is the more traditional approach in which the hide is moved through a series of tannin baths of increasing concetration allowing for the tan to gradually penetrate the hide. This method is labor-intensive, time consuming and requires a vast tanning site and so is rarely used by manufacturers today. However, this approach is also the most natural, allowing the tan to penetrate deeply and evenly resulting in a durable material and a rich finish. The Tochigi Leather Co. has continued to supply Itagaki with vegetable tanned leather of the highest quality for the past 20 years. Based in the Tochigi prefecture, the company has a rich 80 year history specializing in Vegetable Tanning using the Pit Method. 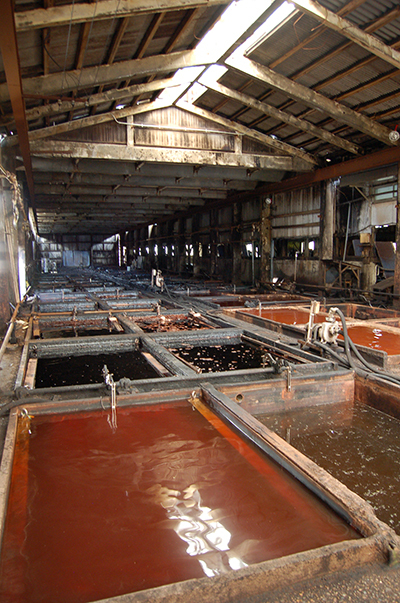 Their tannery hosts 160 tanning pits. They are highly conscious environmentally and are acutely sensitive to the potential hazards that can result from improper waste treatment.